The Afflictions by Vikram Paralkar is described in its blurb as “a magical compendium of pseudo-diseases, an encyclopaedia of archaic medicine,” a claim that is slightly at odds with the brevity and fragmentariness of the book. The reader is treated not to an encyclopaedic experience, but to a series of excerpts from the 327 volumes of a fictional Encyclopaedia medicinae, linked by a framing narrative. Anyone familiar with my writing will know that I have nothing against brevity and fragmentariness per se (quite the opposite), but in The Afflictions there is a tension between those qualities and the way the book has been put together and presented to the public that I find unsatisfying. More of that later. Paralkar’s prose is balanced, genial and articulate. It has an olde worlde quality that is difficult to pin down to a particular setting. Syntax and diction feel predominantly early Twentieth Century, while the story seems to be set in an unspecified feudal Catholic country (possibly Spain), in which writers use quills and the schism between science and superstition has yet to occur. Learning and enquiry are at the heart of the book, and the notion of empire is subtly present throughout; perhaps Paralkar has located his fictional world in the Sixteenth Century. But the intention is clearly not to provide the reader with an obvious milieu. I felt as if I had entered the archetypal world of a Calvino or a Borges, removed from mundane reality yet connected with history. The escapism provided by The Afflictions is one of the chief attractions of the book. Another is the ingenuity of the author in defining and exemplifying his invented ailments. Paralkar is a writer of Twitterature, and in this book he shows his formidable talent for the creation of concise, witty, crystalline prose. Each affliction is neatly contained in a couple of pages, offering the reader a delightful promenade from one to the next, like a saunter through an art gallery. The tone is light and easy. Distinctions between the physical and the metaphysical don’t apply to the symptomatology of the diseases listed here: “the sufferer of Cursed Healer Syndrome… finds himself taking on the disfigurements of those around him”; victims of Oraculum terribile see the future damnation of everyone they look at; the Curse of Sisyphus keeps those afflicted in a cycle of development and regression, perhaps to keep them free from sin. Paralkar’s inventiveness in devising maladies is stunning. The writing is complemented by some striking illustrations by Amanda Thomas, which provide an extra treat. The pictures are decorative and quietly fanciful, but they have the orderly stasis of textbook illustrations. Despite all these excellent qualities, The Afflictions has one significant flaw, namely the framing device, in which an elderly librarian introduces a dwarf called Máximo to the Central Library, housing the Encyclopaedia medicinae. The device attempts to impose a narrative but proves insubstantial and disappointing; there are hints that Máximo is deformed and suffers from some sort of affliction (which might explain his interest in the encyclopaedia), but this plot strand is cursory and undeveloped. The book half promises (but doesn’t deliver) a labyrinthine narrative, in which Máximo’s life and story become intertwined with the grotesque vignettes of the encyclopaedia entries. This is just speculation on my part, but it looks to me as if Paralkar wrote his encyclopaedia entries first and then wondered how he could bring them together into a cohesive whole. Perhaps he should have resisted the urge to make his book resemble a novel; unlinked fragments from the encyclopaedia would have been enough, and might have made for a more satisfying read. He should have let the book be what it wanted to be, and not shoe-horn it into an established form. But don’t let my little grumble about form put you off. 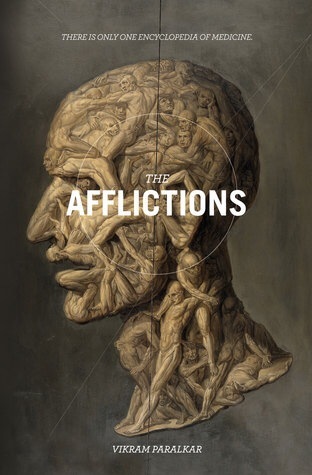 The Afflictions is engaging, entertaining and enchanting, and Paralkar is a writer to watch. Imagine a chessboard made of an infinite number of squares, in which the pieces are locked in eternal stalemate. The Mannequin is white to the Bird King’s black. Where he is broken, mad, risible, she is perfect, glacial, sinister. She is the mask Lady Macbeth presents to her haunted husband. The Bird King is, in part, me, by which I mean that his nest is somewhere in me, between memory and imagination. Although he is a tyrant, he is also vulnerable and silly. Aren’t we all vulnerable and silly? The Mannequin, on the other hand, is totally alien to me. She seems emotionless and inscrutable. I find her mesmerising and nightmarish. What is she thinking? Like Lady Macbeth, she reveals nothing to me. She tells her secrets only to the night. The Bird King and the Mannequin do have one thing in common, however, which is that it is impossible to attach to either of them a stable mental image. If we see either of them in their entirety, in the glare of the sun or a spotlight or headlights, what we see is provisional, a brief phase in their constant mutation. Despite this, the essential identity of each of them is fixed. They are both trapped by who they are. Now, the mannequins are crystallised into a single being, albeit one comprising thirteen separate anatomical parts. Susan Omand has interpreted in paint the text I wrote for each of those parts. I see the book we made as a result of our collaboration as the flipside of The Madness of the Bird King (illustrated by Diana Probst), or, to put it another way, as a view of something at once alive and inanimate, human and monstrous, that exists on the other side of the mirror. Mr Lamb the butcher skulks behind glass, in his kingdom of sawdust and blood. Mr Lamb the butcher numbers among his favourite things curly hair, dew, Miss Marple, black pudding, Punch and Judy, daffodils and thrash metal. “Pleased to meat you,” said Mr Lamb the butcher, eyeing up his new customers, imagining their hanging carcasses, their choice cuts. Mr Lamb the butcher regards the service he provides his customers as a window onto the infinite. He is a hierophant, his mundane work a ritual of cutting, weighing, wrapping, giving. Every Good Friday, Mr Lamb the butcher has himself strung up in the window of his shop, atop a mound of eyes. Mr Lamb the butcher makes flamboyant window displays, in which bald chimeras made from bits of beef, chicken and pork mate, fight or deliver speeches with grandiloquent gestures. Mr Lamb the butcher has a penchant for Debussy. He often becomes glassy-eyed as he hacks meat into retail-ready portions to the melodies of La mer. Once, Mr Lamb the butcher defenestrated a customer who had made a puerile remark about the phallic appearance of a sausage he had just been sold. Every evening, after work, Mr Lamb the butcher sits alone at his little kitchen table and wolfs down a thick stew of offcuts and offal.